And as a public service, that word means rag, is not in Hebrew but in Yiddish, and is generally spelled שמאטע... Gematria value 420, and equivalent (among other things) to אני אוהב אפרוחים. So perhaps this person is simply showing the public his love for marijuana. The Palin thing was a JOKE. HUMOR. HA HA. Actually this one is a Kamea found in Sefer Shorshei HaShemot. I think this one is actually right. 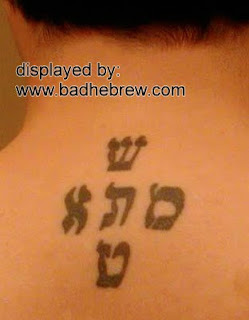 If you mean the 72 names of God from the Kabballah - this tattoo doesn't use any of them. i hardly see how they were supposed to match in gematria. which means "ate oil" just some absurd example i came up with to show how gematria is BS. Gematria is not at all absurd, this person may be absurd with such a tattoo, but Gematria is endlessly fascinating - if you are bored/uninterested by math and/or orthodox-Kabbalah then it would not likely be interesting to you but that is no reason to chime in the passed-judgment remark, many mathematicians love it and it goes a lot deeper than just arithmetic based on letter values, that is like judging literature as a topic when you have only read kindergarten books. "Gematria is endlessly fascinating - if you are bored/uninterested by math and/or orthodox-Kabbalah then it would not likely be interesting to you but that is no reason to chime in the passed-judgment remark, many mathematicians love it"
"interested by math" like how republicans are "interested in climate science" I suppose. Gematria can yield some surprising connections, but should always be taken with a grain of salt. That is to say, YMMV. This is not necessarily "bad hebrew" or "gibberish." There are literally thousands of abbreviations employed in Hebrew, which it would seem nobody has been considering might be the case in this instance. Furthermore, in Jewish Mysticism there are equally numerous ways in which unique "Divine Names" are constructed. Whilst I am not exactly sure whence the curious combination of letters comprising the tattoo in question might have been derived, or what the construct represents, it has been suggested in an earlier response that it is a Hebrew amulet found in a work titled "Shorshei ha-Shemot" by Moses Zacutto. As it is, I am presently gleaning this text for possible details on this tattoo, and will forward the relevant details if I should chance upon any. Be that as it may, I believe one should not so glibly dismiss items such as these as absurd, without considering that they might be comprising Hebrew abbreviations, e.g. of biblical verses, etc., much of which are wellknown and quite genuine.